Shortly after Luke Fickell began his head coaching tenure at the University of Cincinnati, I took a familiar stroll on the campus sidewalk leading to the Richard E. Lindner Varsity Village. Approaching the geometric structure, triangles inversely stacked in rows that stretch the length of the building, I was curious to meet the new coach. Not excited. Not nervous. Curious. And a little conflicted, to be honest. It wasn’t that long ago the previous head coach, Tommy Tuberville, texted me the morning of December 4th he was stepping down. A flurry of text messages soon followed his, from other coaches and folks connected to the program. Like many of you, I opened the Twitter app on my phone and watched the UC fan base celebrate the end of the Tuberville era. I, however, did not join in the celebration. I couldn’t. In hindsight, the writing on the wall first appeared in early November of the 2016 season. After losing to BYU, Tuberville responded to a disgruntled UC supporter as he walked off Nippert’s hallowed turf. From then on, cries for a change at the top were no longer yelled by just fans in the stands. The overtime loss to Tulsa in the season finale sealed Tuberville’s fate. The program (and University) now had what little political cover it needed to make a switch, as a bowl-less 4-8 record looked far worse than a 5-7 bowl appearance. Though my gut told me UC was going in a different coaching direction, I was still surprised when he actually stepped down. And conflicted. Tommy Tuberville and some of his assistant coaches were (and remain) my friends. Despite predominate views expressed about Tuberville on Twitter and comments sections of The Enquirer, he was an engaging friend to pal around with. Socially, he kept a low profile and never acted wealthy or well-known. Though it might sound trite, he was very rural Arkansas and kind to strangers (who weren’t screaming at him). For the last couple of seasons, Tuberville and I would frequently grab beers at Herb & Thelma’s, a hidden tavern just across the river in Covington. The menu and internal decor of the bar are frozen in time, drop ceilings, wood paneling, and a hodgepodge collection of neon signs and bobbleheads. Perched atop his bar stool, Tuberville – after he discovered I grew up a fan of “The General” Robert Montgomery Knight – captivated me with story after story of living down the street from Bobby Knight in Lubbock, Texas. We went to Herb & Thelma’s frequently because he liked their fried bologna sandwiches and knew I did, too. In fact, when Tuberville hired J.B. Grimes away from Auburn, that’s where I met them to share suds and discuss the now-infamous 2016 season. And whenever he spotted me on the sidelines of a practice or game, or inside Varsity Village, Tubberville’d wait for the crowd to dissipate, meander over to catch up, and plan our next trip to Herb & Thelma’s. It’s no wonder, then, as I approached Varsity Village to meet Luke Fickell this winter, I felt conflicted. 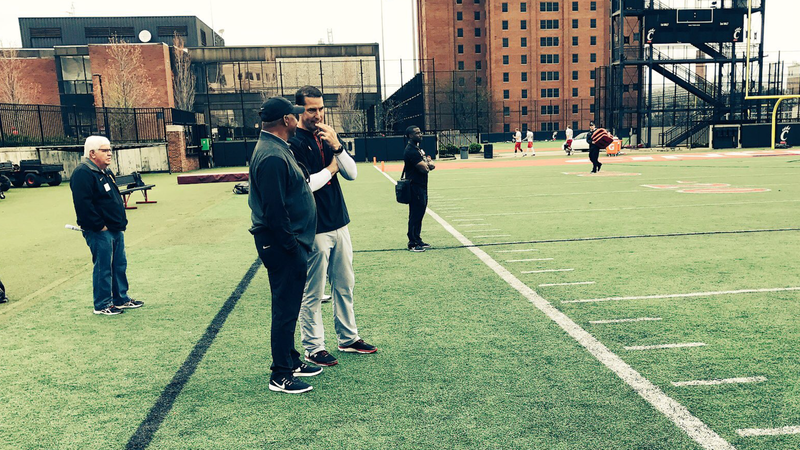 Coach Fickell chats with Marvin Lewis during spring practices. My first meeting with Coach Fickell took place in his office, which was strange for me. Riding the elevator to his floor, I couldn’t recall ever meeting with any of the former UC coaches in their offices, including Tuberville. Not once. Coach Fickell’s office boasts views of Nippert through the triangular windows of the Varsity Village building. Shaking his hand, he’s bigger than you’d imagine. Though he’s thinned from his days of playing nose guard for Ohio State (alongside Dan “Big Daddy” Wilkinson), he’s still physically imposing. Here’s what came through, almost immediately, when we started talking – Luke Fickell is a football guy. 1. Luke Fickell is a football aficionado. An attorney by trade, I asked him a full battery of questions the first time I met him (and each time I’ve talked to him since) to get a better idea of who he is. What do you like to do outside of football? “Spend time with my family,” Fickell stated without equivocation. Do you like to play golf? “Yeah, I guess it’s okay,” Fickell responded. Are you into politics or do you follow political news? “Not really,” Fickell shrugged. Sensing the temperature of the room (or my glaring awkwardness), he interjected a discussion about the facilities and weight room. He segued into how he was excited to make those spaces more efficient and conducive to his program’s needs, offseason effort causes in season success or something to that effect. In other words, Coach Luke Fickell seems like a man with few hobbies and a singular passion for developing football players. Honestly, isn’t that ideal? I can’t imagine Nick Saban juggling too many hobbies in his downtime. It’s hard to imagine Bill Belichick enjoying fantasy baseball. Or golf. It seems like great coaches, at all levels in every sport, are singularly focused on winning. And when I say “focused,” I really mean “obsessed.” If the Bearcats Nation is lucky, we’ll come to learn that Luke Fickell is far more passionate about racking up wins than hobbies. 2. Luke Fickell is a Queen City recruiting machine. For the 2018 class, Fickell has gained commitments from Malik Vann (Fairfield), Josh Whyle (LaSalle), Blake Bacevich (St. Xavier), and Ja’von Hicks (Colerain). Oh, and Scott Googins (Xavier University). 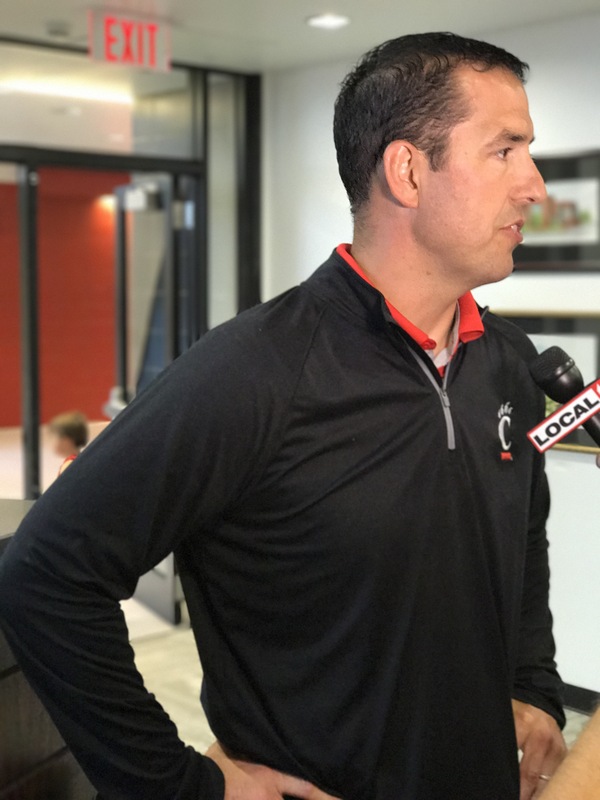 You read that right – Coach Fickell is so prolific a recruiter he recruited UC’s new baseball coach away from crosstown rival, Xavier University. When UC’s Athletic Director Mike Bohn drove to Coach Googin’s house to convince him of the opportunity, Fickell joined. And the rest, as they say, is history. Coach Fickell showed up for Coach Googins’ introductory press conference. Is it his salesmanship? Maybe – he’s an easy enough guy to talk to. Is it his former status as a player for Ohio State? Possibly – his frame still suggests he was a monster defensive lineman. Is it his energy? Probably – he seems intense. Good looks? While I hate to speculate, it’s possible this helps…as I’ve been told he’s “a looker” by female colleagues. Frankly, I think it’s a combination of all of the above and there’s likely much more to it. This much I do know, every time we connect he mentions the two biggest local football conferences, the GCL and GMC, and says those high school athletes are going to be very familiar with him. He continues to make good on that promise. While his on-the-field product remains to be seen, Luke Fickell is racking up victories with local recruits and the fan base. And me. I am excited by the energy he brings to the program, and even better – I am no longer conflicted. Be sure to check back with us for Part 2 of “Wunderkind, Winner, or Wizard? 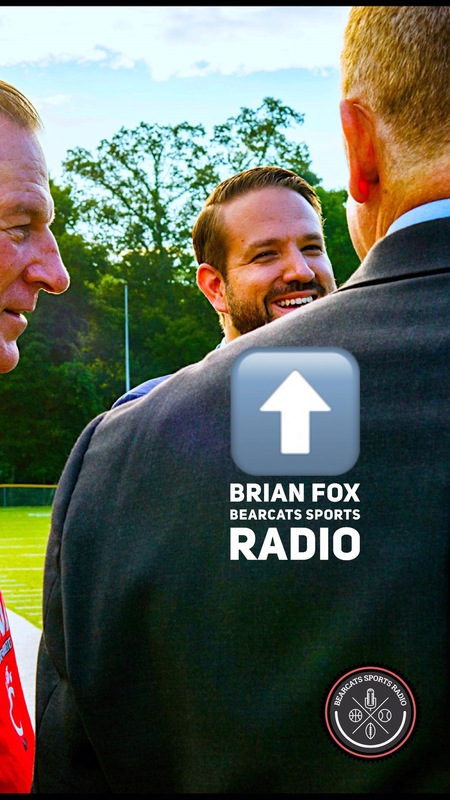 Tuberville’s Take Off & Learning Luke Fickell,” in which I’ll discuss the team of coaches Fickell has assembled, the enhanced physical preparation this summer, and my overall assessment of the team’s transition going into Camp Higher Ground. Also be sure to follow along on Twitter – @BearcatsRadio.